Truly a complementary blend of the traditional and the modern, the Savannah is the most prestigious of the Gems. The Savannah is the most prestigious of the Gems Of Barbados. 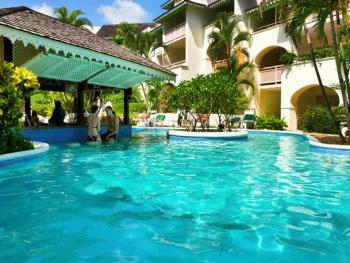 One is just ten minutes away from down town Bridgetown and twenty-five minutes from the International Airport. Almost two hundred years old, its original main building is nicely complimented by the ultra modern architecture and tropical foliage of its newly built extension. Together, they comprise one hundred of the most luxurious rooms on the South Coast. Boasting a beachfront location, the Savannah also offers its guest the choice between two fresh water pools, one of which meanders through the length of the dramatic setting of the new wing. Together with the fitness and beauty facilities for both women and men, Swedish massage, facials, manicures and pedicures, help ensure a leisurely pampering experience. Two restaurants offer a delightful mix of Caribbean and International cuisine and three bars, including the ever-popular ‘swim-up’ bar mix exotic tropical cocktails. Nightly local entertainment (including once monthly Managers’ Cocktail Parties) add sparkle to one of the finest holiday experiences that guests can expect on the South Coast of Barbados. Boasting a beachfront location, the Savannah also offers its guest the choice between two fresh water pools, one of which meanders through the length of the dramatic setting of the new wing. Swedish massage, facials, manicures and pedicures, help ensure a leisurely pampering experience. Discounted Green Fees, preferred tee times and complimentary transfers to Barbados Golf Club are available. Nightly local entertainment (including weekly Managers’ Cocktail Parties) add sparkle to one of the finest holiday experiences that guests can expect on the South Coast of Barbados. The Savannah features a business centre, car rental service, conference room, copying services, express check-in/out, ice machine, laundry, lounge, parking, safe, secretarial services, wake-up service, childcare, international/long-distance calling, doctor on-call, multilingual, shuttle services and a video library. Valid passports or the original or certified copies of birth certificates. If either party was divorced, an original decree absolute or a certified copy of the final judgment. If either party was previously widowed, a certified copy of the marriage certificate and death certificate in respect of the deceased spouse. Return airline tickets. The Savannah Hotel is within walking distance to the famous Garrison Race Track. This is the only horse racing track in the island. Also in the immediate area is the Barbados Museum and Historical Society. Shopping malls, sports bars, restaurants, florists, hairdressers, supermarkets, banks, post office. The Graeme Hall Swamp is only a short taxi ride away. This is the only fresh water lake remaining in Barbados. Major developments including an interpertive centre, were recently completed to enhance the visitor experience. Guests purchasing the MAP or FAP meal plans are entitled to DINE AROUND PRIVILGES at all GEms of Barbados properties, including transportation. The Savannah Hotel is within walking distance to the famous Garrison Race Track. This is the only horseracing track in the island. Also in the immediate area is the Barbados Museum and Historical Society, shopping malls, sports bars, restaurants, florists, hairdressers, supermarkets, banks, post office. The Graeme Hall Swamp is only a short taxi ride away. This is the only fresh water lake remaining in Barbados. Major developments including an interpretive centre, were recently completed to enhance the visitor experience. Casual Dining - The Beach Bar and Grill serves tropical beverages, lunch and snacks in a casual, open air poolside setting overlooking the ocean. Open for lunch.